CHINA -- Norm Elvin hopes his new restaurant, The China Dine-ah Too Go, will become not only a stopping point but also a destination for the thousands of tourists who drive up Route 3 every summer to visit Acadia National Park. 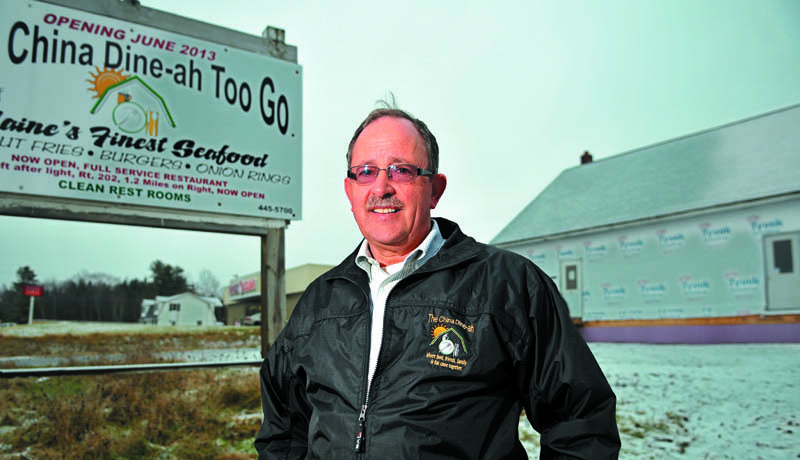 CHINA — Norm Elvin hopes his new restaurant, The China Dine-ah Too Go, will become not only a stopping point but also a destination for the thousands of tourists who drive up Route 3 every summer to visit Acadia National Park. Elvin, owner of Augusta’s G&E Roofing Co. and the original China Dine-ah on U.S. Route 202, will offer fried seafood, lobster rolls, hand-cut fries, burgers, and bakery goods from June through September at the new location that’s now under construction. Opening day for the seasonal business at 363 Route 3 is set for June. “I know there’s a lot of traffic pushed onto this road,” he said Monday. The former driving school and linen shop is getting a major makeover, with workers already on site. The decor will be rustic and similar to that of the original restaurant. So far, Elvin has had to jack up the building to put in a new foundation and is tearing out Sheetrock on the interior of the 2,500-square-foot building. He plans to have two root cellars in the basement so he can buy local vegetables. Town Planning Board member Ron Breton said the new restaurant will be a boost for China, especially since there will be a bakery. The board recently gave Elvin permission to move forward with the project. Customers will place their orders and be able to sit in one of 16 seats inside or on a new 30-seat deck that is yet to be built outside. He will set aside room out back for travelers to walk their dogs and he will advertise clean bathrooms. Just two miles away is China Dine-ah, a full service restaurant with a bar. Elvin is hoping that the new location will help to advertise the other one, which is a sit down restaurant with table service. Although travelers likely won’t hit both locations on the same trip, he hopes they will remember the other location on U.S. 202 on the way back through. Elvin said the new location will be open 11 a.m. to 7 p.m. June through September.